Love comes in all shapes and sizes and in Montreal, our love of food knows no boundaries. That’s why many of us will go the end of the earth (or at least the island) to find our next great meal. État-Major is located near the busy intersection of Pie-IX and Ontario, in the heart of the increasingly bustling HoMa neighbourhood and we discovered that’s there’s a lot to love about this charming French bistro. From the owners of the Plateau’s very popular Quartier General, État-Major makes the most of our city’s love for fine French food. Nicolas Ficuciello helms the kitchen where each day they create a simple yet impactful lunch and dinner menu. Putting their unique spin on French staples like duck, lamb, seafood and more, each dish that leaves the kitchen is a labour of love. My first experience with État-Major was part of burger week. For this year’s burger week, they had prepared a delicious cheeseburger with lime mayo, jalapeños, an onion ring and sharp cheddar. The patty was a mixture of beef and sausage and was one of the most delicious things I’ve ever tasted. Their burger was top on my list to try and when I did I immediately booked them to try their regular menu. A week later, I was back again. Due to the decrease in daylight, we arrived at État-Major for an early dinner, ensuring the best light for our photos. The restaurant already had a few tables filled with people chatting over wine as they waited for their food. The restaurant, like it’s Plateau cousin, is a bring-your-own-wine and is conveniently located across the street from a brand new SAQ. As the evening crept closer to night the restaurant filled to capacity, creating a delightful cacophony of chatter, cutlery and clanking. As we settled into our table we took a look at the chalkboard menu that was set up near the entry. With a dozen or so items on the menu, it didn’t take long to select our dishes. Taking advantage of the table d’hôte, we started things of with a refreshing gazpacho. The soup was at the perfect temperature and pureed to a perfect consistence. It was topped with homemade croutons and drizzled with oil. For our entrées we chose the tartare du jour and the calamari. That evening the kitchen prepared a lamb tartare that was seasoned to perfection and served with crostini. Taking a step away from the traditional fried calamari, the État-Major calamari is fried in a tempura batter and served with a vegetable puree that perfectly balances the plate. Continuing the meal, for our main courses we chose the lamb sirloin and the procelet gaspor. The lamb was perfectly cooked and plated with a savoury puree and topped with slivers of earthy radishes. The pork was tender and juicy with a crispy crust that added a grilled flavour to the meat. The dish was served with roasted carrots and Brussels sprouts on a lightly spiced puree and topped with a dollop of garlic infused sour cream. The dishes were inventive and the use of purees allowed the chef to add his own creative spin. You might thing that dessert was out of the question, having polished off three wonderful plates of food but there was no way were getting out of there without something sweet to punctuate the experience. We tried two desserts, a refreshing French creme with gingerbread and peaches and a must try luxurious chocolate cream with a sweet raspberry coulis. Both desserts were tough to resist and as you can imagine, we caved and devoured them both. 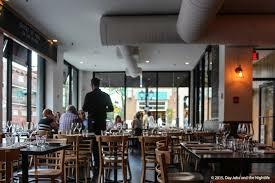 État-Major is a shining star in HoMa’s ever expanding universe of great restaurants. The decor is pleasant yet simple with the restaurant putting the focus on pleasing the palette, allowing the ambiance to be more malleable. The service is warm and friendly without being too invasive. The waitstaff pays attention to their tables and they keep busy helping each other out when needed. From great service to excellent food, État-Major hits all the right notes and we have no problem added them to the restaurants we love. For more information and reservations, visit their website.